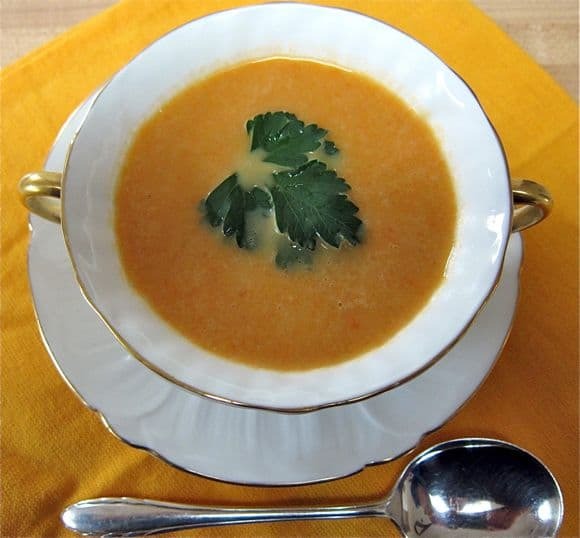 To celebrate Winter Solstice, I made a batch of this creamy carrot-ginger soup, one of my favorite vegetable soup recipes. Although it calls for cream, it doesn’t include any oil or butter, a reasonable balance. You can easily substitute half and half or even whole milk for the cream. Our local farmers market is full of winter produce and I had a bunch of carrots I’d picked up last Friday. Even in the supermarkets, organic carrots are readily available and inexpensive. Since I only had left-over rice following an Asian take-out meal, I bought precooked brown rice at Trader Joe’s. The brown rice is a healthier addition with its added fiber and nutrients. I wanted watercress as a garnish, but was unable to find any this time of year. Flat-leaved parsley works just fine. This soup reheats beautifully. Just be certain not to boil when reheating. 1. Slice the carrots and celery. Place in a large, heavy-bottomed pot (such as Le Creuset). Add onion and ginger. 2. Add the chicken stock and bring mixture to a boil. Reduce heat to medium-low and cook, covered, until vegetables are soft, about 15 minutes. 3. Remove pot from heat and stir in cooked rice. Add salt and pepper and stir. 4. Using a blender, puree soup in small batches and return to pot. 5. Add the cream, stir and correct seasoning. 6. Garnish with watercress or parsley and serve. Yummy soup and lovely blog!!! Thank you for visiting – Happy Holidays to you as well!! Larry was telling me about this when he stopped into Mission Hills Nursery yesterday and he had a smile on his face so I know it’s good. It is delicious, if I do say so myself – pretty healthy too…Say, our tree still smells great – and Larry came home with the prettiest orchid for his 97 year-old Mom. Merry Christmas!! This sounds great! I have never tried pureeing a soup with rice. I’m intrigued! The brown rice doesn’t totally puree – it adds a little texture to the soup. Your soup with kale chips coming up soon! Lovely carrot soup! I like carrot soup it is creamy and delicious! I SO hear you re the sugar overload. I’m starting to pass out cookies by re-gifting them to homeless folks begging at stop lights – honest! I’m going to try making this with 2% milk – bet it will be fine. I love the carrot-ginger flavor combination, such a nice reprieve after all the holiday madness. I’m thinking this would make a nice lunch soup for work days in the midst of January. I made a batch using 2% milk and it came out fine – and, of course, healthier. Thanks for visiting!